CDC flies doubtless belong to the most important fishing flies and are a must for every fly box. 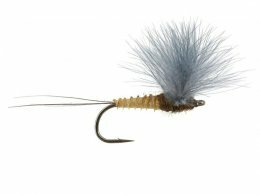 Therefore, we have an ample assortment of over 125 CDC fly patterns! CDC feathers (Cul De Canard) are from the duck and are extremely buoyant due to their special structure: on the one hand the numerous small micro hairs fit perfectly to the water surface tension, and on the other hand they can embrace a lot of oxygen. Attention: CDC flies may not be greased, neither with CDC oil, otherwise the buoyancy will be reduced. The delicate micro hairs cannot embrace any oxygen in a greased condition. CDC oil may solely be used for greasing traditional dry flies, but not CDC flies. LOCHSA from loon outdoors is the only floatant which is suitable for CDC flies. In addition to the excellent buoyancy CDC feathers are especially ideal for the tying of emergers, since the fly body will be hold perfectly in the surface film of the water. Did you know that CDC flies are not yet used on a large scale for so long? Only since about 20 years they have started their triumphal march under the fly fishermen around the globe.